Your home may have concrete slab foundation settlement. 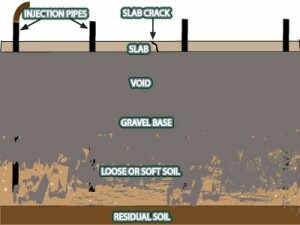 This is due to moisture content and density of your soils beneath the slab. For any slab crack large or small, contact the professionals at Atlas Piers to help with a solution for your cracked slab foundation repair. No matter how they got there, slab cracks are dangerous to your home and family and should be taken care of as quickly as possible. Because the slab is the basis of your home, it affects everything above it, meaning that a simple slab crack could be causing sticking doors or windows, cracked walls, or even sloped floors in the rest of the house. When there are voids around or under the slab and the slab isn’t big enough to span the void, the slab will in turn, crack, split, and settle into the void. Atlas Piers offers pressure grouting which can fill the voids underneath or around your slab. This slab foundation repair process involves drilling through the concrete and pumping a cement-based grout that is under tremendous pressure to fill the void. This is a much less expensive option than removing the concrete via jackhammer, filling the void, and re-pouring the concrete. This can also be used to lift a sinking slab, so it can possibly resolve two issues at one time. Pressure grouting is often used in Atlanta homes to make slab cracks disappear. Helical slab piers will provide support for your failing slab in areas such as garages, basements, and patios in Georgia. Helical slab piers are useful in a number of situations and can be used, often along with pressure grouting, to ensure the stability and evenness of your home’s slab. 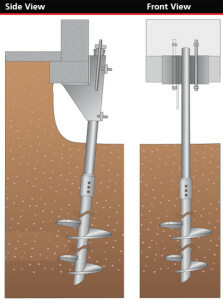 Helical slab piers can be installed in a variety of weather conditions. 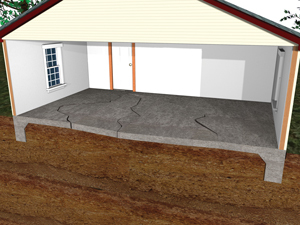 If you notice a slab problem in your Georgia home, don’t hesitate to contact a foundation contractor from Atlas Piers to provide you with a solution. The longer these problems go unresolved, the more damage there will be in the future. Similarly, if you try to solve the problem on your own, you may create more damage. We will be happy to come assess your situation, give you a free estimate, and provide you with the best slab foundation repair solution for your Atlanta home or business. Why wait for your slab problem to get worse? Contact us at Atlas Piers of Atlanta to evaluate your slab foundation repair needs, and provide a solution that works for your home and budget. Remember us for all your concrete repair needs in Atlanta.